Gunnera manicata, native to the Serra do Mar mountains of southeastern Brazil, is perhaps the largest species, with leaves typically 1.5-2 m (5-6 ft) wide, but exceptionally long, up to 3.4 m (11 ft), borne on thick, succulent leaf stalks (petioles) up to 2.5 m (8 ft) long. 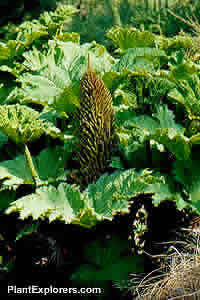 A true giant among perennials, this plant can produce leaves almost 3m (10ft) across on stems as long. Good soil with steady moisture, by a pond or stream perhaps, and a great deal of space, is all you need to enjoy this magnificent plant. For maximum freshness, please keep seed refrigerated in its original packaging until it is time to plant. Seed germinates best in very moist, but not wet, conditions and temperatures of 22 to 29°C. Sow seed in containers in a cold frame. Gentle bottom heat can improve germination, 16-20°C (60-70°F). Grow on in any good moist garden soil in full sun. Mulch the large crowns with the leaves in regions where winter temperatures are likely to drop below -5°C (20°F) A heavy mulch can help these plants survive -17°Celsius (0°F).